You are currently browsing the category archive for the ‘38th Wedding Anniversary’ category. Businesses that do the best are the ones who give their customers a little extra. It is a selling point to do something more for those who make your business happen. This is not an old cliché, it is a pragmatic priority. Our anniversary comes around every year. We save to make sure that we can enjoy a wonderful meal at a classy restaurant. Enjoying God’s blessings over so many years is a testimony to His faithfulness and goodness. We parked and waited for a small break in our standard Houston inclement weather downpour. When a lull came, we scampered from our vehicle and trotted together under one umbrella holding on to each other while we laughed and hopped over water puddles. Under the cover of the building eave we shook off the beaded up rain water and casually walked to the striking front entrance of the restaurant. When I announced to the receptionist that we were there for our reservation, she checked her ledger and smiled, “Please follow me.” The restaurant was elegant and the atmosphere was welcoming. Every one of the staff that we passed along the way looked up and smiled with a word of welcome. The receptionist seated us. A standard setting at the table was appropriate. Then, we both noticed the added feature on our table. 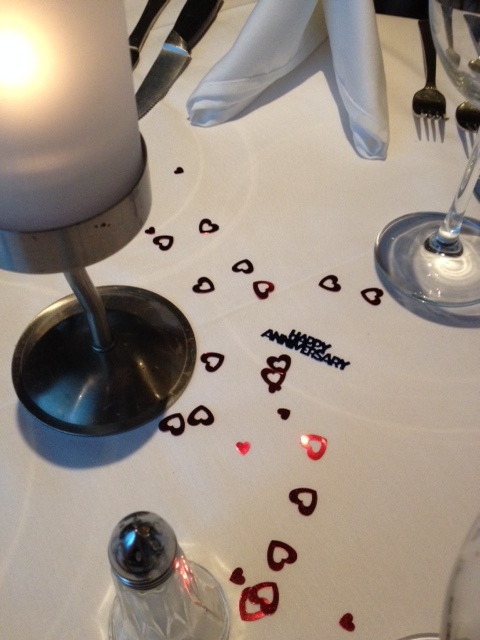 Scattered on our table-cloth were confetti. 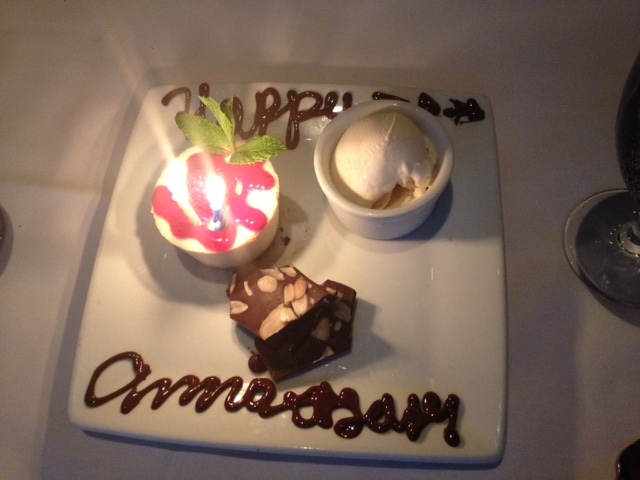 Mylar figures depicting an anniversary celebration made our setting a wonderful surprise. We both laughed, smiled and played with the pieces of different shapes, colors and enjoyed the extra sparkle from the lights and candles. It was a simple extra. But, it was a surprise. They did not have to do that but we sure enjoyed it. Admittedly, this dinner at Ruth’s Chris was delicious. The chefs at this restaurant are extraordinary. Every bite is flavorful and makes you rehearse in your soul the meaning of savor. At the end of the meal our very friendly waiter never asked us if we would like to order dessert. Instead, he brought out a flaming complementary dish of sweets for us to share. It is the little extras that make a huge difference, don’t you agree?